Also known as the Chinese violet, the viola is a small plant native to east Asia. It can reach a height of approximately 9 inches, with small purple flowers that bloom in April and May. In China, the viola grows in the lower reaches of the Yangtze River and the provinces of southern China. The entire plant (including the roots) is gathered during the summer, cleaned, dried in the sun, then cut into pieces for medicinal use. 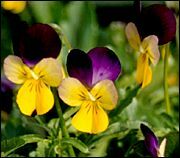 In traditional Chinese medicine, viola is considered bitter, pungent and cold, and is associated with the Heart and Liver meridians. Its main functions are to clear heat and release toxins, and to resolve masses. Typically, it is used externally to treat skin conditions such as boils and carbuncles. It can also be used to treat snake bites. Recent research in China has shown that viola is also effective against some types of viruses and bacteria, and can reduce inflammation. How much viola should I take? The typical dosage of viola is between 10 and 16 grams, based on the condition being treated. Usually, viola is mixed with water as part of a decoction. Larger amounts can be used if viola is being applied externally. Viola juice is sometimes used to treat snake bites. What forms of viola are available? Whole, fresh or dried viola can be found at some Asian markets and specialty stores. Some shops also sell viola powders, pills and decoctions. What can happen if I take too much viola? Are there any interactions I should be aware of? What precautions should I take? Viola should not be taken by patients who have been diagnosed with deficient cold syndrome. As of this writing, there are no known drug interactions with viola. As always, make sure to consult with a licensed health care provider before taking viola or any other herbal remedy or dietary supplement. Bown D. Encyclopedia of Herbs and Their Uses. London: Dorling Kindersley, 1995. Huxley A. The New RHS Dictionary of Gardening. MacMillan Press, 1992. Ismail S, Shukor A. Plant Protection Quarterly 1998, vol. 13, pp. 140-142. Viola (fresh, organic). Available at TAI Botanicals Web site. Viola herb. Eastern Chinese Medicine Wholesale & Retail Company Web site.